Put dish soap and water on the stain and let it set for about a minute. Take a white t shirt and put it over the stain. Use the very edges so that you can repeat this step by using all the surface area of the t-shirt. Take hot iron and run it over the t-shirt that is over the stain. you will start to notice the stain transferring onto the t-shirt. In my case, at the end of this procedure, my t -shirt was almost completely red and it also took out a lot of dirt that one might not notice. Repeat these steps until it is all gone. It's like magic! 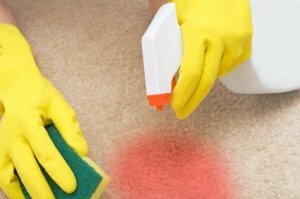 How can I get a red Kool Aid stain out of my carpet without using an iron (because I don't own one)? 2 parts hydrogen peroxide and 1 part blue Dawn. Scrub gently with brush. Spray with distilled water and blot with clean white rag. Use Soft-Scrub without bleach. This removed a cherry/vomit stain which occurred when our then 4-year old gorged herself on cherries. We were sure we would have to replace the carpet until we used this. We enjoyed the carpet for many more stain-free years. Pour clean hot water over the stain then cover with a white towel, iron the towel over the stained area and then move the towel each time it has abdorbed any of the stain. Once fairly dry, repeat as necessary. This takes time but it does work. Using a white towel enables you to check if the stain is actually coming out. How do I get Kool-Aid stains out of my carpet? The best way I know is to use your steam iron. Wet a white towel and wring it nearly dry. Turn your iron on the highest steam setting. Place the wet towel over the rug stain, then hold the iron a little above the towel and steam away. You may need to do this several times to get the entire stain out. You should be able to see the stain move from the rug into the wet cloth. How do I get Kool-Aid stains out of carpet? 1/4 tsp. mild liquid dishwashing detergent with 1 cup of lukewarm water. 1 cup of white vinegar with 2 cups of water. Keep blotting the area with a white cloth until the stain no longer transfers onto the white cloth, not rubbing but pressing. If this is not helping, then make up an ammonia solution, remember never to use any kind of bleach with ammonia, not even on a spot that had bleach on it. You could hurt yourself by the fumes. Mix 1 Tbsp. of ammonia with 1 cup of water if the stain is still visible. Sometimes ammonia will lighten the carpet a touch. How do I get a red Kool-Aid stain out of my carpet? I use oxyclean with good results, and a scrub brush. I have red stains on my carpet from Kool-Aid. I think Ive tried everything, even ironing it out. Any ideas? Many years ago I had a vomit/cherry stain on new carpet. I used Soft Scrub without bleach and it was the only thing that worked. I still have the carpet! I did best with the Dawn method (not the extra power kind, just the plain kind). Hope one works for you! Post back your progress! I've had good effect with hydrogen peroxide and also enzymatic cleaners. But I have never tried to take off something like Kool Aid, which could be tough since it's actually dye IE meant to permanently stain things. Mix 2 cups of water (that is warm) with 1/4 tsp dish detergent, like Dawn. Dampen the area, but do not soak it with this mixture. Lay a white cloth over the stain. Run an iron over the stain, not pressing down on the iron. Keep on doing this until the stain is gone. Use a clean part of the towel each time you iron above the stain. Keep repeating this until the stain is gone. Use a fresh towel to go over the area and make the carpet look like it did before, fluffy and clean. How do I get red Kool-Aid out of carpet? Scrub it with Dawn. You can also shampoo the carpet and put a bit of oxyclean in with the shampoo. I have had good success using vinegar to remove old wine stains. 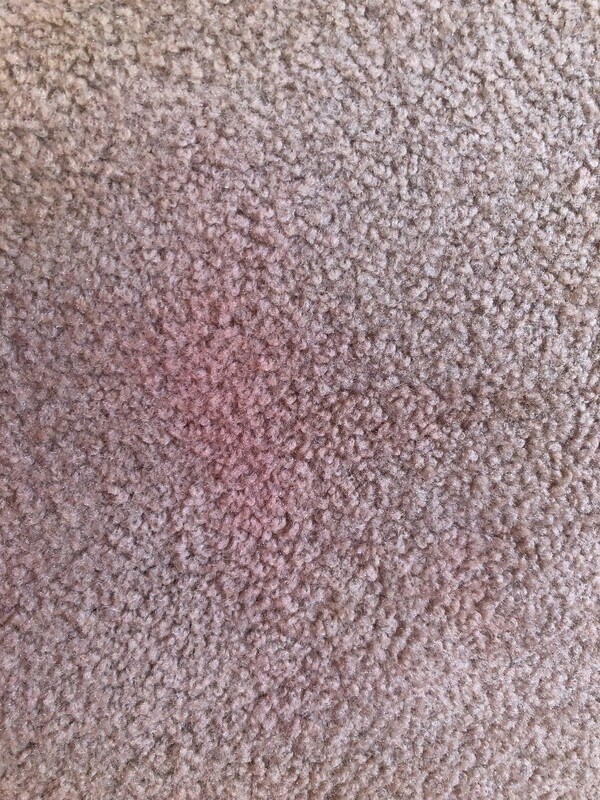 My grandbaby spilled her red Kool-Aid like drink on my light colored carpet. I have tried carpet shampoo, dish soap, rubbing alcohol, and Greased Lightning on it. Nothing has worked. I am looking for suggestions on household remedies to get it up. I have got several future brothers-in-law at my house and they love Kool Aid. I have several stains now and I am having trouble getting them out. I made a home solution consisting of Dawn dish soap, LA Awesome, vinegar, and hot water. I pour the solution on the stain and scrub the area with a brush for five minutes and then I use my carpet cleaner (filled with hot water) and go over the area until there is no more soap coming up and it stops sucking up water. So far it gets 99% of the stain out, but it is still pink (barely noticeable unless you're really paying attention.) The thing is I am a perfectionist and I want to get it completely out. Any ideas? How do I remove a red Kool-Aid stain from carpet? The stain got lighter, but it's still there. My suggestion is to go and buy new carpet! of carpet. To recolor go to hobby/craft shop and buy color pen inks (like a Sharpie). One brand is Prismacolor. They're used to color cloth craft projects. You will need several color combo's to match rug and "clear blender"
found this site. Amen! I applied stick Spray N Wash because that was all I had, a white t-shirt and hot iron. How do you get red Kool-aid out of carpet? How can I get red Kool-Aid stains out of the carpet? How do I remove red Kool-aid stains from carpet? I am looking for info on getting red punch Kool-Aid stain out of white upholstery. I have a red Kool-Aid stain that I have already used a carpet cleaner on. What else can I use to get the stain out of my carpet? How do I clean red Kool Aid out of white carpet? We recently bought a condo, unfortunately the people living before us left red Kool-aid stains in the beige carpet. I have been trying for 6 months to clean it with little luck, any suggestions? How can I remove red Kool-Aid from a beige carpet? I need to know how to get red Kool aid out of my carpet. How do you get red Kool Aid out of carpet? It is on beige carpet, I have tried everything to clean it up. How do I remove red Kool Aid stain from carpet? How do I remove red Kool-aid from carpet? How do you remove red Kool-aid stains from carpet? I am needing help in getting red kool-aid and soda out of my carpet I have tried hydrogen peroxide and its not helping.